If you have an iPhone 8 or an iPhone 8 Plus, you’re undoubtedly psyched that Apple finally added wireless charging support. Of course, now you have to find a good wireless charger. There’s nothing wrong with going the bargain-basement route. In fact, we highly recommend this $13 wireless charging pad. 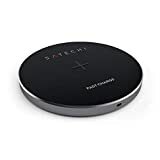 But if you want something a bit better suited to the sleek design of Apple’s new iPhones, definitely check out the Satechi Fast Wireless Charger. It’s a beautiful little device that’s wrapped in aluminum with a polished, beveled edge to complete the look. It’s easily on par with the most expensive chargers on Amazon, but it’s only $29.99! * WIRELESS CHARGING – sleek and stylish wireless charger allows you to charge your iPhone 8/8+ and other Qi-compatible devices without attaching a charging cable every time you want to charge your device. * FAST CHARGING – option to charge your device up to 1.4x faster than standard wireless charging pads. Your device will indicate if it is fast-charging when placed on the charging pad (Please use QC 2.0 or Samsung original adapter and cable to enable fast charge feature). * PREMIUM ALUMINUM CONSTRUCTION – stylish design comes in four metallic colors: gold, silver, space gray, and rose gold. * LED INDICATOR LIGHT – Blue LED light indicates device is charging, green LED light indicates device is fully charged. * COMPATIBLE W/ QI-ENABLED DEVICES – Qi Standard compatible with iPhone 8/8+, Nexus, Samsung Galaxy, Note, LG, HTC smartphones, and more! Note: iPhone 7 and other non Qi-enabled devices require a Qi adapter for wireless capability.